The Enviro Council has been busy keeping up appearances at the local Mission Heights Reserve. 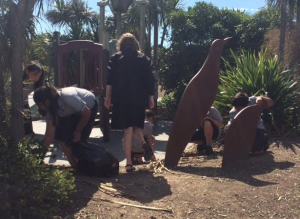 Through Auckland Council’s ‘Adopt a Park’ programme, students monitor and report on the state of the park. Here you can see several Enviro Council members collecting rubbish so everyone can enjoy a clean park. 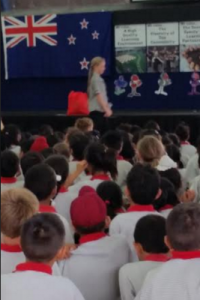 Compared to their Term 1 rubbish collection last year, students collected three fewer bags of rubbish – a positive improvement! 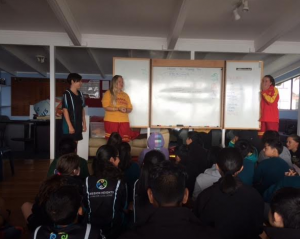 Mountains Year 9 students visited the Mairangi Bay Life Surf Saving Club on the 31st March. After spending time indoors learning about rips and reading tides, students headed into the ocean. Everyone practiced saving their friends with floatation devices and boogie boards and also learned about beach patrol protocols. 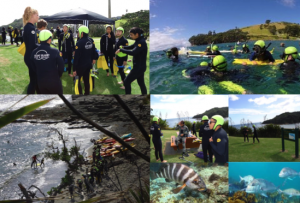 As a part of Term 1’s “Fight for Life” learning context, Year 9 students from Water Whanau travelled to the Goat Island Marine Reserve on Thursday 31st March. Students viewed the sealife by snorkelling from the beach under the care and supervision of PADI Divemasters and teachers. A large range of species were visible in the marine reserve, such as large 40 year old snapper, blue cod, red moki, sting rays, jelly fish, sea urchins and kelp. Thank you to Miss Young for planning this wonderful EOTC experience! Year 9 KDEC students, Jordan, Charlie, Ula, Adam and Courtney visited Saint Paul’s Church this morning as a part of their Maths learning with fractions and financial literacy (money, prices and change). KDEC students prepared fruit to serve to guests following their service. KDEC students enjoyed the opportunity to develop personal leadership and inter-personal communication skills with people beyond their MHJC classroom. 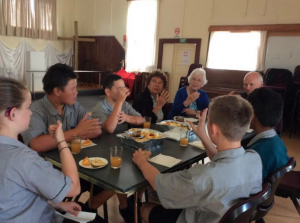 The students also taught community members numbers , basic everyday words, greetings as well as the alphabet in New Zealand Sign Language (NZSL). This sharing proved valuable as the priest has progressive hearing loss! On the 16th March Year 7 students from Water Whanau set off on an exciting camp with twenty Year 10 leaders. 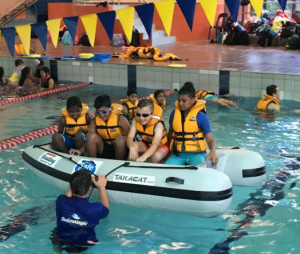 Day one started with a splash as students participated in a day of water safety fun at the Massey Park Pools, Papakura. 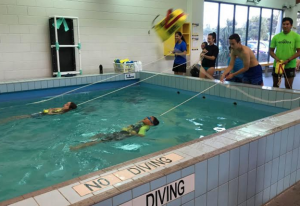 Students capsized out of boats, learned life-saving and floatation techniques and experienced the currents of the lazy river. 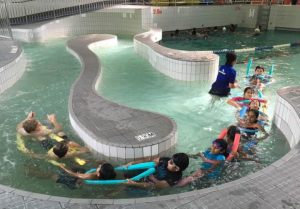 At the end of the rotation cycle students particularly enjoyed some free time in the wave pool. Campers then jumped back on the bus and continued the long journey to Piha. After many sing-alongs students finally arrived at Piha Mill Camp and were placed into ‘tribes’ for the next three days. The competition between the six tribes was evident from the beginning. After a fun afternoon participating in different activities at Piha Beach students returned to camp for some dinner. Thursday saw an early rise followed by a quick breakfast before heading off for an action-packed day of camp activities. Students all participated in archery (“Mockingjay”), camp cooking (“MasterChef”), problem solving, the Amazing Race and hiking to the beautiful Kitekite Falls. Throughout these activities students had the chance to earn points for their tribe, as well as earning “camp money” from the Year 10 leaders. The camp show was next on the list. Students all showcased a variety of talents, including magic card tricks, singing, extreme make-overs and even a performance by the teachers! It was a fun-filled night, during which the “winning tribe” was announced. Congratulations to the Green Tribe who took out Water Camp 2016. It was fantastic to see such strong relationships grow between Year 7 and Year 10 students throughout the camp. Thank you to Mr Field-Mitchell and Miss Young for organising the camp and to all students who made Water’s Camp 2016 such an awesome and memorable experience! Four students attended the annual Travelwise Student Workshop to plan their communication plan for the year. 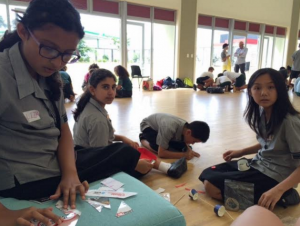 Wasan Abu Nada (8M2), Victoria Kree (8M1), Leon Lei (7C1) and Aliza Azba (7W2) participated in activities to identify how to advertise, develop key messages and tag lines, and also had the opportunity to use a speed gun on local traffic. The photograph (below) shows the girls participating in a ‘Road Safety’ relay race. Stay tuned for further information from the team, who have decided to focus their efforts on reducing the speed of drivers around the school this year. This year MHJC took 8 of our Elite Y7&8 swimmers to the South Eastern Zone (SEZ) swimming competition. All of the swimmers where very competitive during the heats. However, Marissa Dodd (7F2) qualified for the final in the following events: 50m Junior Girls Freestyle, 50m Junior Girls Backstroke and 100m Junior Girls Freestyle. We congratulate Marissa for finishing 3rd overall in the 100m Junior Girls Freestyle. On the 18th March two MHJC students, Erin-Leigh Pye (7M1) and Ether Gray-Lefale (7C1) returned to their primary, Baverstock Oaks School, for a very special occasion. Last year they were both involved in an art project to create a massive mural of the school’s six core values. 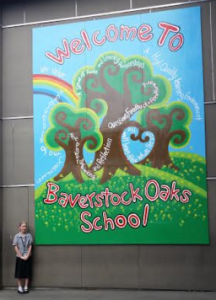 Baverstock had it erected this week and wanted to say a special thank you to the artists at a formal assembly. ‘Biking’ is a DEEP course offered at Mission Heights Junior College to support students to increased levels of skill and confidence to ride safely in the community. 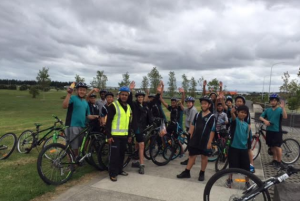 Bikers have the opportunity to learn the road rules whilst developing physical fitness and appreciation for sustainable transport options for a cleaner, greener New Zealand. Students cycle an average of 6km during the 45minute session with teacher, Mr Vivashal Singh. 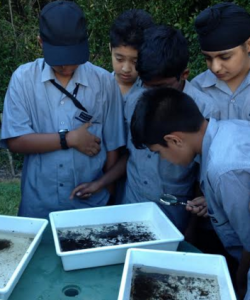 Year 7 students from Water Whanau have been engaging in hands-on learning about the plight of the Long Fin Eel and their habitats. Long Fin Eels are endemic to New Zealand and are considered to be an endangered species. As a part of their Term 1 ‘Camp’ context, students were fortunate to work with Kate Loman from WaiCare to conduct a series of water quality tests for the streams behind MHJC and in the Tane Forest. Students tested for water quality parameters such as Ph, water temperature, clarity and dissolved oxygen. Students also enjoyed some close encounters with macro invertebrates in the streams (pictured below). 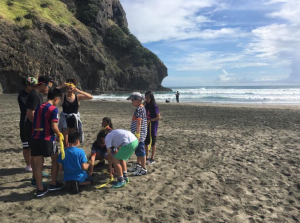 As a part of their camp experience this week, students will be hiking to the beautiful Kitekite Falls in Piha in the hope to see larger Long Fin Eels that are 20-80 years old. As the eels only spawn at the end of their life cycle in trenches near Tonga, any eels that are caught within New Zealand’s waterways are prevented from reproducing. Students are completing first hand research and social action to protect New Zealand’s Long Fin Eel and it’s habitat.